And here is the last entry, the winner of our contest and the 60-day game card! I really enjoyed her creative description of the ingredients and directions. 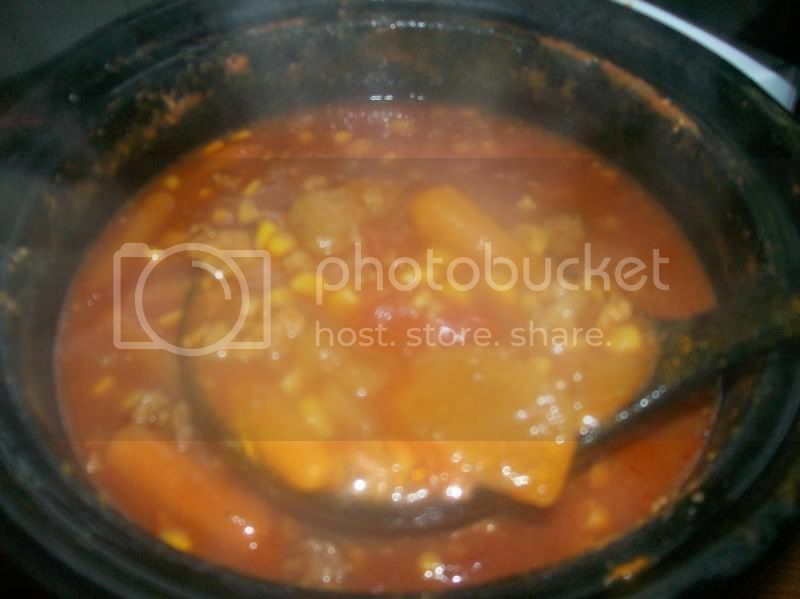 The idea for this stew came to me one afternoon following a long grueling battle against the alliance in Warsong Gulch. My allies and I dirty and bloody from mopping the grounds with alliance scum found ourselves sitting around discussing some of our favorite meals and the inspiration came to me. Trust me you will find no stew more satisfying to consume after battle than this one! *Amount is based on what you can gather or have on hand. Fresh is reccomended of course. Brown the chilled meat to desired color. (Some prefer a bloodier taste than others) Mix all the above ingrediants together. The spices are done to taste. Cook on high flame for about seven hours. For best results cook outside of an alliance base while hurling insults at those within earshot. Reduce flame and simmer for a few hours more. You want the ears and fingers to be soft and gushy and teeth to be easy to bite into. Serve the stew in the skull of a fallen Draenei and enjoy! Also if you find yourself without a Draenei skull you can use a regular bowl but honestly what kind of a fighter doesn’t already have a supply of alliance skulls in their home? Okay, so the ingredients don’t totally match up, but it’s a fish and looks like the one you get ingame. And yes, that’s a cellphone picture. My apologies for not looking too appetizing. Preheat oven to 350F. Double check to make sure fish is clean and completely scaled. If you’d like, remove the tail and fins to fry separately. Score the fish on both sides. Salt and pepper inside and outside. Throw the garlic teeth inside the cavity. Place fish in a shallow baking pan (deep enough to hold the beer though). Drizzle the lemon juice all over the fish, then spread mayonnaise on the top of it. Don’t go crazy with the mayo; it’s there mainly to keep the fish from drying out. Pour the beer into the pan, as much as needed to get about a 1/4 inch deep lake of hoppy goodness. Pop into oven for 15-25 minutes, depending on the size of the fish. A 1-2lb fish should take closer to 15 minutes, whereas a 3-4lb fish will be closer to 25 minutes. When the fish is done, take it out. Cut the orange(s) in halves or quarters, use as garnish and for drizzling over the fish in place of more lime. I hope the mayo doesn’t scare anyone. It really doesn’t taste of mayonnaise at all, and the fish stays very moist.